IOWA: Man Burns Local Public Library's LGBT Children's Books Because Something Something Jesus [VIDEO] - Joe.My.God. 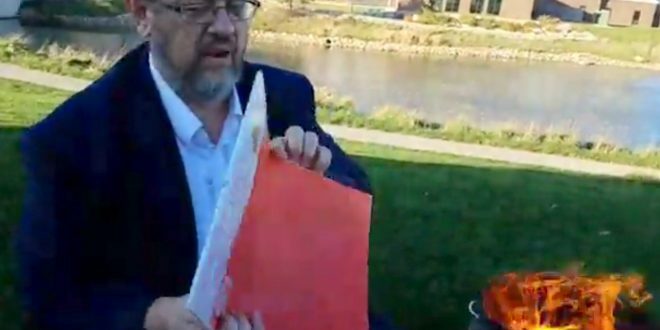 The Orange City Public Library said it’s exploring legal options after a northwest Iowa man rented and then publicly burned several children’s books Friday. The second annual OC Pride kicked off Friday with a story time for kids, a schedule shows. About an hour before the event, Paul Dorr started a live Facebook video, in which he stood near the Prairie Winds Event Center. The 27-minute video ends with Dorr throwing at least four books with LGBTQ themes that he claimed he rented from the public library into a burning trash can. The burning comes near the end of the clip.